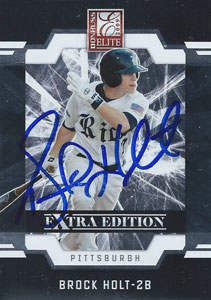 Brock Holt was born on Saturday, June 11, 1988, in Stephenville, Texas. Holt was 24 years old when he broke into the big leagues on September 1, 2012, with the Pittsburgh Pirates. His biographical data, year-by-year hitting stats, fielding stats, pitching stats (where applicable), career totals, uniform numbers, salary data and miscellaneous items-of-interest are presented by Baseball Almanac on this comprehensive Brock Holt baseball stats page. Did you know that you can compare Brock Holt to other rookies who also had their Major League debut during the 2012 National League season ? You can follow the team links in the chart above to locate common statistics (singles), advanced statistics (WHIP Ratio & Isolated Power), and unique statistics (plate appearances & times on bases) not found on any other website. If you find this type of "free" data useful please consider making a donation to Baseball Almanac : a privately run / non-commercial site in need of financial assistance.